Human CMV infection results in MHC class I down-regulation and induction of NKG2D ligand expression favoring NK recognition of infected cells. However, human CMV-encoded UL16 counteracts surface expression of several NKG2D ligands by intracellular retention. Interestingly, UL16 interacts with MICB, but not with the closely related MICA, and with UL16-binding proteins (ULBP) ULBP1 and ULBP2, which are only distantly related to MICB, but not with ULPB3 or ULBP4, although all constitute ligands for NKG2D. Here, we dissected the molecular basis of MICA-MICB discrimination by UL16 to elucidate its puzzling binding behavior. We report that the UL16-MICB interaction is independent of glycosylation and demonstrate that selective MICB recognition by UL16 is governed by helical structures of the MICB α2 domain. Transplantation of the MICB α2 domain confers UL16 binding capacity to MICA, and thus, diversification of the MICA α2 domain may have been driven by the selective pressure exerted by UL16. Natural killer cells are instrumental in the immune control of persistent infections by CMVs in mouse and man (1, 2). Whereas virus-mediated down-regulation of MHC class I molecules relieves NK cells from inhibitory signals by infected cells, NK recognition and cytolysis of virally infected cells additionally requires expression of ligands for activating NK receptors (3, 4). To date, few cellular ligands of activating NK receptors have yet been identified (4, 5) and these also turned out to be targeted by virally encoded immunoevasins: the poliovirus receptor/CD155, a ligand of the activating NK receptor DNAM-1, has recently been reported to be down-modulated by the human CMV (HCMV)3-encoded UL141 (6, 7). Likewise, the MHC class I-related ligands of the activating NKG2D receptor are subjects of various immunoevasive strategies of CMVs, because their expression is strongly induced upon infection (2, 8, 9). NKG2D, a C-type lectin-like homodimeric receptor, is expressed on NK cells and subsets of T cells and transmits stimulatory signals via the associated adaptors DAP10 (in humans) or DAP10 and DAP12 (in mice) (3, 10, 11, 12, 13). In mice, the NKG2D ligands (NKG2DL) H60, RAE1α-ε, and MULT-1 are all induced upon mouse CMV (MCMV) infection of fibroblasts, but sequestered by the MCMV gene products m155, m152, and m145, respectively (2, 14, 15). Consequently, cell surfaces of MCMV-infected cells remain bare of NKG2DL eluding NKG2D-mediated immunosurveillance. In humans, NKG2D interacts with cell stress-inducible MIC molecules MICA and MICB, transmembranous proteins with MHC class I-like α1, α2, and α3 domains (10, 16, 17, 18, 19). Human NKG2D also engages the UL16-binding protein (ULBP) family members ULBP1–4 that were originally identified due to the interaction of ULBP1 and ULBP2 with the HCMV-encoded UL16 glycoprotein (16, 20, 21). ULBP are built up by an MHC class I-like α1α2 superdomain, but lack an α3 domain, and ULBP1–3 are attached to the cell surface by a GPI anchor (20, 22). Previously, we and others reported that HCMV infection strongly induces expression of MIC and ULBP molecules and that HCMV-encoded UL16 counteracts cell surface expression of several NKG2DL by sequestration in the endoplasmic reticulum (ER) (8, 9, 23, 24). In contrast to MCMV, where each NKG2DL family is separately targeted by different MCMV proteins, UL16 binds human NKG2DL across protein families by selectively binding to MICB, ULBP1, and ULBP2, and ignoring MICA, ULBP3, and ULBP4 (9, 21, 23, 24, 25). This is fairly surprising, because ectodomains of MICA and MICB are very similar by amino acid sequence (85% identity) and tertiary structure, but only distantly related to ULBP molecules (23–27% identity) that share 55–60% amino acid sequence identity among each other (18, 19, 20). This indicated that UL16, like NKG2D, is able to structurally adapt to highly divergent proteins (26, 27, 28). However, it also offered a rationale for the puzzling redundancy of NKG2DL, which may have emerged to avert viral immunoevasive strategies here exemplified by UL16. We investigated the molecular basis of selective interaction of UL16 with NKG2DL by addressing the distinctive binding of UL16 to MICA vs MICB. MICA and MICB were chosen because of their high sequence similarity, the availability of crystal structures (17, 18, 19), and the numerous MIC-specific reagents available in our laboratory. To define MICB structures critical for UL16 binding, we produced soluble UL16-Fc, exchanged domains, subdomains, and single amino acids of MICB against the homologous MICA structures, and assayed the resulting MIC mutants for binding to soluble UL16. A partial UL16 sequence encoding the predicted signal peptide (aa −25 to −1) and the extracellular domain of UL16 (aa 1–159) was amplified by PCR from a previously cloned UL16 cDNA sequence isolated from HCMV strain AD169 (9) and inserted via NotI sites into the pcDNA3.1 vector in front of the coding sequence of human IgG1-Fc. The plasmid encoding UL16-Fc was stably transfected into CV-1 cells cultured in DMEM containing 7.5% low IgG FBS (Invitrogen Life Technologies) and 2 mg/ml G418 (Invitrogen Life Technologies). The UL16-Fc fusion protein was purified from culture supernatants by protein A affinity chromatography. Production of soluble NKG2D tetramers has been described previously (9). In brief, the ectodomain of human NKG2D was produced in Escherichia coli, refolded, and biotinylated at an N-terminal BirA-tag using the BirA enzyme (Avidity). Excess biotin was removed by fast protein liquid chromatography with a Superdex S75 HL 26/60 column and biotinylated NKG2D tetramerized by addition of PE-conjugated streptavidin (Molecular Probes). Anti-MICA/B mAb BAMO1 (IgG1), BAMO3 (IgG2a), BAMO6 (IgG1), anti-MICA mAb AMO1 (IgG1), anti-MICB mAb BMO1 (IgG1), BMO2 (IgG2a), anti-ULBP1 AUMO1 (IgG1), anti-ULBP2 mAb BUMO1 (IgG1), and anti-ULBP3 mAb CUMO3 (IgG1) have been generated in our laboratory as previously reported (9, 29). In brief, BALB/c mice were repeatedly immunized with P815 cells transfected with MICA*01, MICA*04, MICB*02, ULBP1, ULBP2, or ULBP3, respectively, and splenocytes of immunized mice fused with P3X63Ag8.653 myeloma cells. Resulting hybridoma supernatants were screened by flow cytometry using MIC- or ULBP-transfected C1R cells. Hybridoma producing NKG2DL-specific Abs were subcloned twice. Specificity of mAb was verified by flow cytometric analyses of NKG2DL transfectants and, for MIC-specific mAb, by binding assays using recombinant MICA and MICB, respectively (Ref. 29 and data not shown). Epitopes of BAMO3 and BAMO6 were mapped to the MICA α3 domain by flow cytometric analysis of transiently expressed ULBP2 (α1α2 domain)-MICA(α3 domain) chimera (data not shown). Epitopes of AMO1, BMO1, BMO2, and BAMO1 were mapped to the helical surfaces of the MIC α1α2 platform domain, because these mAb competed with soluble NKG2D tetramers for binding to MICA or MICB molecules, respectively, in flow cytometric analyses (data not shown). Chimeric MIC molecules used in this study include portions of MICA*01 and MICB*02 as outlined in Table I⇓ and Fig. 3⇓A. The respective gene fragments were obtained by PCR from the MIC cDNAs and overlap extension PCR was used to construct the chimeric molecules. The chimeric DNA sequences were inserted into the SacII and BamHI cloning site of the expression vector RSV.5 neo. The chimeras C1 and C2 were generated by swapping the SacII and EcoRV restriction fragments of MICA*01 and MICB*02 cDNA. The MICB*02 mutants containing single or double substitutions of amino acids with the homologous MICA*01 amino acids (M10T, Q14W, R41C, A56N/E57K, T61R, E68G, S102N, Q125K/S127W, T143R/W146L, R158H, Q161H, K167E, Q169R) were created by using the QuikChange Site-Directed Mutagenesis kit (Stratagene) following the manufacturer’s protocol. All constructs were verified by sequencing. For intracellular retention assays, full-length UL16 cDNA was inserted into the NotI and EcoRI sites of pIRES-EGFP (Clontech). COS-7 cells were maintained in IMDM supplemented with 10% FBS and grown to 60–80% confluency before transient transfection. Transfection was performed using FuGENE 6 reagent (Roche) according to the manufacturer’s instructions and transfected cells analyzed 48 h later by flow cytometry. To address relevance of glycosylation, transfected COS-7 cells were cultured with 10 μg/ml tunicamycin (Sigma-Aldrich) 36 h before analysis. Cells were incubated with anti-MICA/B, anti-ULBP mAb, or appropriate mouse Ig isotypes followed by incubation with PE-conjugated goat anti-mouse secondary Ab (Jackson ImmunoResearch Laboratories). UL16-Fc was used at 40 μg/ml and binding visualized with PE-conjugated anti-human Ig Ab (Biosciences). PE-labeled NKG2D tetramers were used at 5 μg/ml. Samples were analyzed with a FACSCalibur (BD Biosciences). Goat anti-mouse IgG-coated microspheres (Bangs Laboratories) were loaded with α3 domain-specific anti-MICA/B mAb BAMO3 and subsequently coated with 2 μg/ml MICA or MICB expressed in E. coli (29) or in a eukaryotic expression system (R&D Systems). Coated microspheres were then incubated with 40 μg/ml UL16-Fc or UL16-Fc pretreated with peptide:N-glycanase F (PNGase F) (New England Biolabs). UL16-Fc binding was assessed by its competition with PE-labeled human NKG2D tetramers (5 μg/ml) for binding to immobilized MIC molecules. Samples were separated by 15% SDS-PAGE. Where indicated, samples were treated before with PNGase F (New England Biolabs) for 1 h at 37°C according to the manufacturer’s instructions. Gels were blotted to Hybond-ECL membranes (Amersham Biosciences). Membranes were blocked with TBS containing 5% nonfat dried milk, incubated with anti-MICA/B mAb BAMO1, washed, and blocked again, and binding of BAMO1 was detected with a goat anti-mouse IgG HRP conjugate together with SuperSignal West Pico chemiluminescent substrate (Pierce) as previously described (30). In a search for proteins interacting with the HCMV-encoded UL16 glycoprotein, Cosman et al. (20) identified MICB and the novel ULBPs ULBP1 and ULBP2. Surprisingly, UL16 did not bind to MICA despite its high MICB relatedness with regard to primary sequence and tertiary structure (9, 20). Here, we addressed the molecular basis for the distinction of UL16 between MICA and MICB using soluble UL16. Soluble UL16-Fc comprising the entire UL16 ectodomain was expressed in CV-1 cells and purified from the supernatants with protein A columns. As expected, the deglycosylated UL16-Fc hybrid molecules exhibit an apparent molecular mass of ∼45 kDa, whereas untreated UL16-Fc is considerably larger due to extensive N-linked glycosylation (Fig. 1⇓A). In previous reports, selective interaction of UL16 with MICB, ULBP1, and ULBP2 has been shown by cellular coexpression systems or using MICB-Fc, ULBP1-Fc, or ULBP2-Fc (9, 20). Here, we corroborate these findings by showing that soluble UL16-Fc selectively interacts with cell surface MICB, ULBP1, and ULBP2, but not MICA or ULBP3 on NKG2DL-transfected C1R cells (Fig. 1⇓B). Because MICA is highly polymorphic and some MICA allelic variants (e.g., MICA*04) share amino acids with MICB that differ in MICA*01, we also tested UL16-Fc binding to C1R cells stably expressing high amounts of the fairly diverse MICA*04, MICA*07, and MICA*08 allelic variants. Soluble UL16 did not bind to any of the MICA allelic variants, suggesting that they share common structural features precluding UL16 binding (Fig. 1⇓C). Expression and binding characteristics of soluble UL16-Fc. A, Purified UL16-Fc was treated with (+) and without (−) PNGase F, analyzed by reducing SDS-PAGE, and visualized by Coomassie staining. PNGase F is marked with an asterisk. 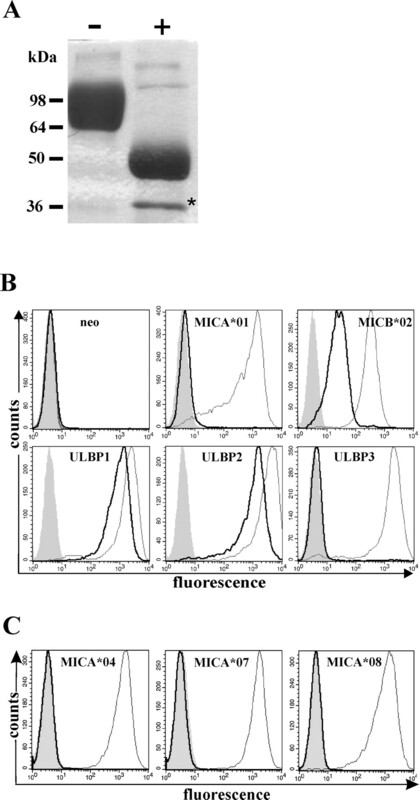 B, UL16 binds to MICB*02, ULBP1, ULBP2, but not to MICA*01 and ULBP3, as assessed by flow cytometric staining of mock-transfected (neo) and NKG2DL-transfected C1R cells with UL16-Fc (thick lines). Bright surface expression of MICA, MICB, ULBP1, ULBP2, and ULBP3 was verified with mAb AMO1, BMO1, AUMO1, BUMO1, and CUMO3, respectively (thin lines). Ig isotype controls are shaded. C, UL16 does not bind to MICA*04-, MICA*07-, or MICA*08-transfected C1R cells (thick lines). MICA surface expression was detected with BAMO1 (thin lines). Isotype controls are filled histograms. The UL16 and MICB ectodomains are heavily glycosylated, with eight and five N-linked glycosylation sites, respectively, which may substantially contribute to the UL16-MICB interaction. Furthermore, N-linked glycosylation sites in the platform domain of MICB (N141) differ in number and location from those in MICA (N8, N56, N102) raising the possibility that MICA-MICB discrimination by UL16 may be guided by differential glycosylation. Relevance of MICB glycosylation for UL16 binding was investigated by transiently expressing MICB in the presence of tunicamycin. Although tunicamycin treatment resulted in a reduced MICB surface expression on transiently transfected COS-7 cells, it did not abrogate UL16 binding to MICB (Fig. 2⇓A). Immunoblotting of COS-7 lysates revealed that MICB molecules of tunicamycin-treated cells were of lower molecular mass presumably due to lack of glycosylation underlining the efficacy of tunicamycin treatment (Fig. 2⇓B). Interaction of UL16 with MICB does not depend on glycosylation. A, COS-7 cells were transfected with MICB*02 and treated with tunicamycin (10 μg/ml) or mock-treated for 36 h, subsequently stained with UL16-Fc, and analyzed by flow cytometry. UL16-Fc bound mock-treated (thin line) and tunicamycin-treated (thick line) MICB transfectants (right panel). Control stainings of MICB transfectants with BAMO1 are displayed by the left panel. B, Immunoblot analysis of lysates of COS-7 cells transiently transfected with MICB*02 and treated with tunicamycin (+) or untreated (−). MICB was detected with BAMO1. C, BAMO3-coated microspheres were loaded with MICA or MICB expressed in E. coli (pro) or in a eukaryotic expression system (eu), respectively, and assayed for binding of PE-labeled soluble human NKG2D tetramers in the absence (stippled lines) or presence of UL16-Fc (thick lines) or PNGase F-treated UL16-Fc (shaded) by flow cytometry. Relevance of glycosylation for the interaction of UL16 and MICB was also directly addressed using a competitive binding assay. Pro- and eukaryotically expressed MICA and MICB, respectively, were loaded on microspheres and subsequently incubated with UL16-Fc. UL16 binding to MIC molecules was measured by its capacity to impair binding of soluble NKG2D to immobilized MIC molecules. Preincubation of MIC-loaded microspheres with UL16-Fc impaired NKG2D binding to MICB, whereas UL16-Fc did not interfere with NKG2D binding to MICA, irrespective of source and glycosylation of MIC proteins (Fig. 2⇑C). This demonstrated that UL16 binds MICB independently of glycosylation and that amino acid sequence differences in MICA are responsible for abrogating UL16 binding. We also addressed the relevance of N-linked glycosylation of UL16 for MICB binding by deglycosylating UL16-Fc with PNGase F and detected no differences to untreated UL16-Fc in binding to pro- or eukaryotically derived MICB (Fig. 2⇑C). Hence, the selective interaction between UL16 and MICB is not guided by N-linked sugars. Competition of soluble UL16 and NKG2D for binding sites on MICB and UL16 binding to α3 domain-less ULPB1 and ULPB2 indicates that UL16 binds to the α1α2 platform domain of MICB. We directly addressed this assumption by generating MICA/MICB chimeric proteins where the α1α2 platform domain was exchanged. As predicted, UL16-Fc strongly bound to the MICBα1α2MICAα3 chimera C2, but not to the MICAα1α2MICBα3 chimera C1 (Fig. 3⇓, A and B; Table I⇑). When cotransfected with UL16-EGFP into COS-7 cells, surface expression of C1 as for wild-type MICA was not affected by UL16, whereas neither C2 nor MICB molecules reached the cell surface in the presence of UL16 (data not shown). UL16 interaction with the MICB platform domain is critically determined by the α2 domain. A, Schematic representation of MICA/B chimera depicting MICA (white) and MICB (black) sequences. Numbering relates to amino acids of the mature MIC protein. B, UL16-Fc binds MICB and C2, but not MICA or C1 at the surface of transfected COS-7 cells (thick lines). Expression of MIC molecules and chimeras was monitored with mAb BAMO3 (thin lines). UL16-Fc also weakly binds to mock-transfected COS-7 cells (filled histograms) presumably reflecting UL16 binding to endogenous NKG2D ligands. C, UL16-Fc binds to chimeras C4, C5, and C6 at the surface of transfected COS-7 cells, but not to C3 (thick lines). Expression of MIC chimeras was monitored with mAb BAMO3 (thin lines). UL16-Fc binding to C6 is weaker compared with C4 and C5. UL16-Fc stainings of untransfected COS-7 cells are filled histograms. To further delineate the structural elements of MICB involved in UL16 interaction, chimeric MICA molecules were constructed by exchanging stretches of the MICA*01 α1α2 platform domain by homologous MICB*02 subdomains. All chimeric proteins were readily detectable at the cell surface of transfected COS-7 cells by MICA/B-specific mAbs BAMO1 and BAMO3 (Table I⇑ and Fig. 3⇑). UL16-Fc did not bind chimera C3 (bbaaA) containing the α1 domain of MICB*02 (Fig. 3⇑, A and C). In contrast, strong UL16 binding was observed when the α2 domain of MICA was replaced with the MICB α2 domain (C4/aabbA), strongly suggesting that the MICB α2 domain critically determines UL16 binding. Because UL16 competes with NKG2D for MICB binding, it is conceivable that the α-helical regions of the MICB α2 domain constitute a major binding site for UL16. To test this hypothesis, α-helical regions of both α1 and α2 domains (C5/ababA) or only of the α2 domain (C6/aaabA) of MICA*01 were substituted for MICB sequences. Interestingly, UL16-Fc bound to both chimeric MIC molecules, although the binding to C6 was somewhat weaker compared with wild-type MICB (Fig. 3⇑C). Although these results demonstrated that transplantation of the MICB α2 domain confers UL16 binding specificity to MICA, it could not be ruled out that this was due to an indirect effect affecting the conformation of a distant UL16 binding site. Therefore, we analyzed direct binding of UL16 to the MICB α2 domain by blocking studies with MICB-specific mAb. As expected, mAbs BAMO3 and BAMO6, which bind to the α3 domain of MIC molecules, did not compete with UL16 for binding to C1R-MICB transfectants (Fig. 4⇓A). However, UL16-Fc binding to MICB was completely inhibited by preincubation of C1R-MICB*02 cells with anti-MICB specific mAb BMO1 and BMO2 that bind the MICB α1α2 platform domain. Using the MIC chimeras, we mapped the BMO2 epitope to the helical region of the α2 domain, formally demonstrating direct competition with UL16 for binding to this MICB subdomain (Fig. 4⇓B and Table I⇑). Taken together, these data demonstrate that the MICB α2 domain and in particular its helical region are major determinants of UL16 binding. UL16 competes with MICB α2 domain-specific BMO2 for MICB binding. A, UL16-Fc binds to C1R-MICB*02 in the absence of competing Abs (filled histograms). Preincubating C1R-MICB*02 with α1α2 domain-specific mAb BMO1 and α2 domain-specific mAb BMO2, but not with α3 domain-specific mAb BAMO3 and BAMO6 resulted in abrogation of UL16-Fc binding to C1R-MICB*02, respectively (thick lines). Thin lines depict binding of the respective mAb to C1R-MICB*02 in the absence of UL16-Fc. B, Flow cytometric analyses of MIC chimeras C1, C2, C3, C4, C5, and C6, transiently transfected into COS-7 cells, with BMO1 (thick line) and BMO2 (thin line) demonstrating BMO1 specificity for the MICB α1α2 domain and BMO2 specificity for the helical part of the MICB α2 domain. BAMO3 binds to the α3 domain of both MICA and MICB and documents surface expression of MIC chimeras (filled histograms). MICA*01 and MICB*02 differ by 13 aa in the α2 domain of which 6 are located in the β-pleated sheet (G106;R108;N113;Q125;S127;V129), 1 in an exposed loop (S102) and 6 in the α-helical regions (T143;W146;R158;Q161;K167;Q169). We mutated all solvent exposed residues and all residues within the α-helices as well as selected residues of the α1 domain to the corresponding amino acids of MICA*01 to pinpoint residues important for UL16 binding. All mutants were readily expressed at the cell surface of COS-7 cells, although some at lower levels than others (Fig. 5⇓ and data not shown). Mutants E68G and K167E were both excluded from the analysis, because they did not bind NKG2D and therefore lack of UL16 binding may be due to incorrect folding of the α1α2 domain. Mutant S102N had no detectable adverse effect on UL16-Fc binding, similar to α1 domain-specific mutants M10T, Q14W, R41C, A56N/E57K, and T61R. 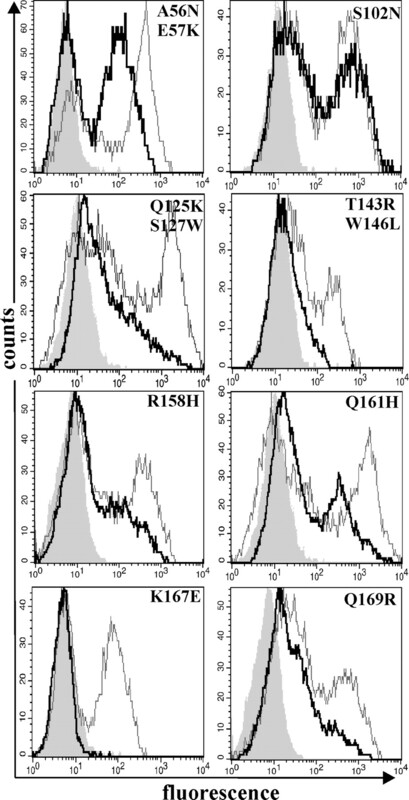 However, impaired UL16-Fc binding was observed for double mutants Q125K/S127W and T143R/W146L and single mutants R158H and Q169R (Figs. 5⇓ and 6⇓). 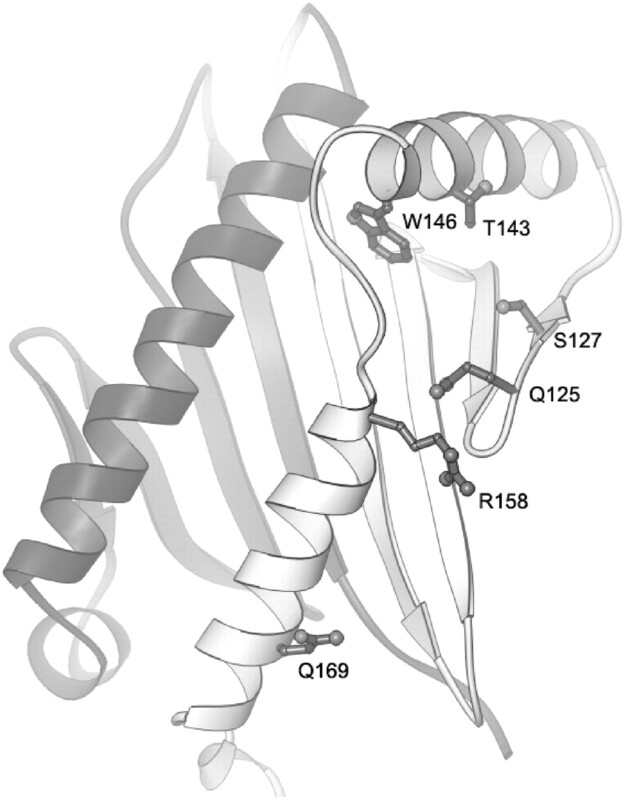 Q161 is like R158 and Q169 an exposed position in the helical region of the α2 domain, but mutating Q161 to the corresponding MICA*01 residue (Q161H) only affected UL16 binding when this mutation was introduced into the weak UL16-binding chimera 6, not in the context of MICB*02 or chimera 4 (Fig. 5⇓ and data not shown). MICB amino acids affecting UL16 specificity. UL16-Fc strongly binds to MICB mutants A56N/E57K, S102N, and Q161H, whereas UL16 binding to MICB mutants Q125K/S127W, T143R/W146L, and Q169R is impaired (thick lines). UL16-Fc binding to R158H appears slightly affected. UL16-Fc does not bind to MICB mutant K176E that also lost NKG2D-binding capability. Surface expression of mutants is monitored with the α3 domain-specific mAb BAMO3 (thin lines). UL16-Fc stainings of untransfected COS-7 cells are filled histograms. Mapping of MICB residues affecting UL16 binding. Ribbon drawing of the α1α2 platform domain of MICB (PDB code 1JE6 (19 )). The α1 and α2 regions are shaded in dark and light gray, respectively. The side chains of residues Q125, S127, T143, W146, R158, and Q169 are shown in ball-and-stick representation. Residues R158 and Q169 likely define primary contact points for UL16, whereas mutation of the other residues most likely results in conformational changes that affect binding. The figure was prepared using RIBBONS (39 ). HCMV employs a plethora of molecular strategies to evade antiviral NK and T cell responses. In a combined action of HCMV-encoded US2, US3/US11, and US6 proteins, for example, MHC class I molecules are down-regulated on HCMV-infected cells, minimizing CD8 T cell reactivity but rendering HCMV-infected cells vulnerable to NK cytotoxicity (1, 2, 31). Products of the UL18 and UL40 genes are thought to counteract NK susceptibility as they constitute ligands of inhibitory NK receptors (2, 31). NK reactivity against HCMV-infected cells is further suppressed by a set of HCMV proteins that prevent surface expression of host proteins engaging activating NK receptors. Among these is the UL16 glycoprotein that selectively retains the HCMV-induced NKG2D ligands MICB, ULBP1, and ULBP2 in the ER (9, 20). Although it has been reported by several groups some years ago that UL16 selectively retains MICB, but not the highly related MICA, the structural basis of this phenomenon has not yet been addressed. Here, we demonstrate using soluble UL16 and chimeric MICA/MICB molecules that MICB specificity of UL16 is critically determined by the MICB α2 domain. A direct interaction of UL16 with the MICB α2 domain was corroborated by blocking of UL16 binding with a mAb specific for the MICB α2 domain. In contrast, sequence differences in the MICA vs MICB α2 domain preclude UL16 from binding to MICA. This is most clearly demonstrated by experimental replacement of the MICA α2 domain against the MICB α2 domain that transforms the resulting MICA variant into a UL16-binding protein. Further insight into the UL16 binding specificity was provided by mutagenesis studies where single amino acids of the MICB α2 domain were substituted by the corresponding MICA residues. Substitutions of aa 125/127, 143/146, 158, and 169 all resulted in an impaired UL16 binding to the respective MICB mutants. Side chains of aa 125, 127, 143, and 146 are partially or completely buried and thus may determine the overall conformation of the MICB α2 domain (Fig. 6⇑). In fact, W146 is located at the apex between the two α-helices of the α2 domain and has previously been implicated in stabilizing this structure (18). Superpositioning of MICA and MICB shows that the area around residues 143–146 has somewhat different conformations in both structures. Replacement of either residue 143 or 146 may therefore affect the overall conformation of the protein and indirectly influence UL16 binding. In contrast, glutamine 169 is fully solvent exposed and does not mediate any contacts with other residues. Replacement with arginine strongly impairs UL16 binding, suggesting a direct contact between Q169 or its immediate neighbors and UL16 (Fig. 5⇑). We note that a superposition of the MICA and MICB structures reveals almost no differences in the vicinity of residue 169, indicating that it is indeed the side chain of residue 169, rather than structural differences between MICA and MICB that determines UL16 binding. Interestingly, the ULBPs ULBP1 and ULBP2 contain glutamate at the homologous position (E167), whereas the non-UL16-binding protein ULBP3, like MICA, encodes for an arginine (R167). A productive interaction with UL16 is therefore probably polar in nature and adversely affected by a positive charge at position 169 in MIC and position 167 in ULBP molecules, respectively. Most of the R158 side chain, and especially its guanidinium group, is also exposed to solvent. The observation that replacement by the smaller histidine results in loss of binding suggests that R158 also lies at or near a contact point with UL16, perhaps forming a hydrogen bond. Consistent with this model is the fact that both ULBP1 and ULBP2 have very large side chains capable of hydrogen bond formation at this position (Lys and Tyr, respectively), whereas the non-UL16-binding ULBP3 carries a methionine. The prediction that arginine 158 plays an important role in UL16 binding is also consistent with the finding that mutating glutamine 125, which is mostly buried but whose amide group contacts the Cα and Cδ atoms of the R158 side chain, adversely affects UL16 binding. The most likely explanation is that Q125 helps to orient the R158 side chain or limits its mobility. Q161 is a third exposed MICB-specific residue within this α-helical region, but, in contrast to R158 and R169, only affected UL16 binding when mutated in the context of chimera 6 that exhibits a reduced UL16 binding indicating that Q161 provides a minor contribution to UL16 binding. Overall, our analysis indicates that residues on the surface-exposed face of the second α-helix in the α2 domain primarily mediate direct binding to UL16 in MICB. Residues on the terminal β-strand (near R158) and in the first α-helix likely also contribute to binding, but they do so most likely through indirect interactions and subtle alteration of the conformation of MICB. Appearance of MICA and MICB genes has been attributed to a gene duplication ∼14 million years ago (32). Duplication of a primordial MIC gene may have provided the substrate for a rapid evolvement of an UL16 escape variant, i.e., MICA, that abrogated the UL16 binding site by accumulating mutations in the α2 domain. Alternatively, one may argue that ignorance of MICA by UL16 is due to immunosuppressive properties of MICA. In fact, evidence has been reported that MICA expression may impair proliferation of CD4 T cells via an NKG2D-independent mechanism (33). However, this has also been reported for the mouse NKG2DL H60, which is efficiently targeted by the MCMV-encoded glycoprotein m155 (14). An immunosuppressive effect was also described for soluble MICA (sMICA) that is shed from tumor cells by metalloproteases (30): it has been postulated that sMICA systemically down-regulates NKG2D expression in tumor patients, thereby impairing the antitumor response of CD8 T cells and NK cells (34, 35). However, it is unlikely that sMICA serum levels in HCMV-infected individuals reach levels equivalent to those in cancer patients, and recent studies from our laboratory show that the UL16 targets MICB and ULBP2 likewise can be released in soluble forms (29, 36). In fact, a recent study reported evidence that surface expression of MICA is counteracted by an unknown UL16-independent HCMV-encoded mechanism (37). Thus, one may speculate that escape of MICA molecules from UL16-mediated ER retention is “tolerated” by HCMV, because another HCMV-encoded immunoevasin prevents functional engagement of NKG2D by MICA. Interestingly, MICA*08 molecules that are by far the most prevalent MICA allelic variants in Caucasians and that lack a cytoplasmic domain due to a premature stop codon are not targeted by this mechanism (37, 38). Overall, these findings are in support of the hypothesis that redundancy of NKG2DL genes as well as the pronounced MIC polymorphism (e.g., the escape variant MICA*08) may be the result of pathogenic pressure. In conclusion, we demonstrate that UL16 binding to MICB is critically determined by residues in the MICB α2 domain and that MICA escape from UL16 binding is due to its altered α2 domain. It remains to be determined how UL16 accomplishes binding to MICB and the highly divergent ULBP1 and ULBP2 and how this binding mode is akin to the interaction of NKG2D with its ligands. Resolution of the complex between UL16 and MICB and UL16 and ULBP1/2, respectively, by crystallography will ultimately unravel this structural phenomenon. We thank Wiebke Ruschmeier for excellent technical assistance. ↵1 This work was supported by grants from the Deutsche Forschungsgemeinschaft (STE 828/2 to A.S. and GK794 to J.S.). ↵3 Abbreviations used in this paper: HCMV, human CMV; MCMV, mouse CMV; NKG2DL, NKG2D ligand; ULBP, UL16-binding protein; ER, endoplasmic reticulum; sMICA, soluble MICA; PNGase F, peptide:N-glycanase F.
French, A. R., W. M. Yokoyama. 2003. Natural killer cells and viral infections. Curr. Opin. Immunol. 15: 45-51. Lodoen, M. B., L. L. Lanier. 2005. Viral modulation of NK cell immunity. Nat. Rev. Microbiol. 3: 59-69. Raulet, D. H.. 2003. Roles of the NKG2D immunoreceptor and its ligands. Nat. Rev. Immunol. 3: 781-790. Lanier, L. L.. 2005. NK cell recognition. Annu. Rev. Immunol. 23: 225-274. Moretta, A., C. Bottino, M. Vitale, D. Pende, C. Cantoni, M. C. Mingari, R. Biassoni, L. Moretta. 2001. Activating receptors and coreceptors involved in human natural killer cell-mediated cytolysis. Annu. Rev. Immunol. 19: 197-223. Groh, V., R. Rhinehart, J. Randolph-Habecker, M. S. Topp, S. R. Riddell, T. Spies. 2001. Costimulation of CD8 αβ T cells by NKG2D via engagement by MIC induced on virus-infected cells. Nat. Immunol. 2: 255-260. Wu, J., Y. Song, A. B. Bakker, S. Bauer, T. Spies, L. L. Lanier, J. H. Phillips. 1999. An activating immunoreceptor complex formed by NKG2D and DAP10. Science 285: 730-732. Diefenbach, A., E. Tomasello, M. Lucas, A. M. Jamieson, J. K. Hsia, E. Vivier, D. H. Raulet. 2002. Selective associations with signaling proteins determine stimulatory versus costimulatory activity of NKG2D. Nat. Immunol. 3: 1142-1149. Gilfillan, S., E. L. Ho, M. Cella, W. M. Yokoyama, M. Colonna. 2002. NKG2D recruits two distinct adapters to trigger NK cell activation and costimulation. Nat. Immunol. 3: 1150-1155. Hasan, M., A. Krmpotic, Z. Ruzsics, I. Bubic, T. Lenac, A. Halenius, A. Loewendorf, M. Messerle, H. Hengel, S. Jonjic, U. H. Koszinowski. 2005. Selective down-regulation of the NKG2D ligand H60 by mouse cytomegalovirus m155 glycoprotein. J. Virol. 79: 2920-2930. Krmpotic, A., M. Hasan, A. Loewendorf, T. Saulig, A. Halenius, T. Lenac, B. Polic, I. Bubic, A. Kriegeskorte, E. Pernjak-Pugel, et al 2005. NK cell activation through the NKG2D ligand MULT-1 is selectively prevented by the glycoprotein encoded by mouse cytomegalovirus gene m145. J. Exp. Med. 201: 211-220. Steinle, A., P. Li, D. L. Morris, V. Groh, L. L. Lanier, R. K. Strong, T. Spies. 2001. Interactions of human NKG2D with its ligands MICA, MICB, and homologs of the mouse RAE-1 protein family. Immunogenetics 53: 279-287. Li, P., S. T. Willie, S. Bauer, D. L. Morris, T. Spies, R. K. Strong. 1999. Crystal structure of the MHC class I homolog MIC-A, a γδ T cell ligand. Immunity 10: 577-584. Li, P., D. L. Morris, B. E. Willcox, A. Steinle, T. Spies, R. K. Strong. 2001. Complex structure of the activating immunoreceptor NKG2D and its MHC class I-like ligand MICA. Nat. Immunol. 2: 443-451. Holmes, M. A., P. Li, E. W. Petersdorf, R. K. Strong. 2002. 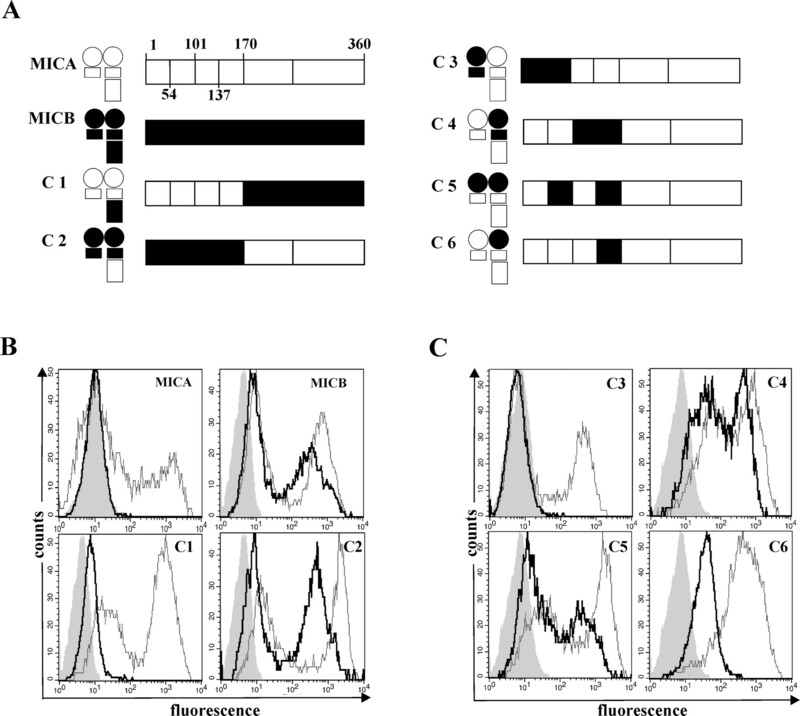 Structural studies of allelic diversity of the MHC class I homolog MIC-B, a stress-inducible ligand for the activating immunoreceptor NKG2D. J. Immunol. 169: 1395-1400. Jan, C. N., C. L. Sutherland, W. A. Lawrence, A. Rein-Weston, D. Cosman. 2003. ULBP4 is a novel ligand for human NKG2D. Biochem. Biophys. Res. Commun. 305: 129-135. Radaev, S., B. Rostro, A. G. Brooks, M. Colonna, P. D. Sun. 2001. Conformational plasticity revealed by the cocrystal structure of NKG2D and its class I MHC-like ligand ULBP3. Immunity 15: 1039-1049. Wu, J., N. J. Chalupny, T. J. Manley, S. R. Riddell, D. Cosman, T. Spies. 2003. Intracellular retention of the MHC class I-related chain B ligand of NKG2D by the human cytomegalovirus UL16 glycoprotein. J. Immunol. 170: 4196-4200. Dunn, C., N. J. Chalupny, C. L. Sutherland, S. Dosch, P. V. Sivakumar, D. C. Johnson, D. Cosman. 2003. Human cytomegalovirus glycoprotein UL16 causes intracellular sequestration of NKG2D ligands, protecting against natural killer cell cytotoxicity. J. Exp. Med. 197: 1427-1439. Radaev, S., M. Kattah, Z. Zou, M. Colonna, P. D. Sun. 2002. Making sense of the diverse ligand recognition by NKG2D. J. Immunol. 169: 6279-6285. McFarland, B. J., R. K. Strong. 2003. Thermodynamic analysis of degenerate recognition by the NKG2D immunoreceptor: not induced fit but rigid adaptation. Immunity 19: 803-812. McFarland, B. J., T. Kortemme, S. F. Yu, D. Baker, R. K. Strong. 2003. Symmetry recognizing asymmetry: analysis of the interactions between the C-type lectin-like immunoreceptor NKG2D and MHC class I-like ligands. Structure 11: 411-422. Salih, H. R., H. Antropius, F. Gieseke, S. Z. Lutz, L. Kanz, H. G. Rammensee, A. Steinle. 2003. Functional expression and release of ligands for the activating immunoreceptor NKG2D in leukemia. Blood 102: 1389-1396. Salih, H. R., H. G. Rammensee, A. Steinle. 2002. Cutting edge: down-regulation of MICA on human tumors by proteolytic shedding. J. Immunol. 169: 4098-4102. Tortorella, D., B. E. Gewurz, M. H. Furman, D. J. Schust, H. L. Ploegh. 2000. Viral subversion of the immune system. Annu. Rev. Immunol. 18: 861-926. Fukami-Kobayashi, K., T. Shiina, T. Anzai, K. Sano, M. Yamazaki, H. Inoko, Y. Tateno. 2005. Genomic evolution of MHC class I region in primates. Proc. Natl. Acad. Sci. USA 102: 9230-9234. Kriegeskorte, A. K., F. E. Gebhardt, S. Porcellini, M. Schiemann, C. Stemberger, T. J. Franz, K. M. Huster, L. N. Carayannopoulos, W. M. Yokoyama, M. Colonna, et al 2005. NKG2D-independent suppression of T cell proliferation by H60 and MICA. Proc. Natl. Acad. Sci. USA 102: 11805-11810. Wu., J. D., L. M. Higgins, A. Steinle, D. Cosman, K. Haugk, S. R. Plymate. 2004. Prevalent expression of the immunostimulatory MHC class I chain-related molecule is counteracted by shedding in prostate cancer. J. Clin. Invest. 114: 560-568. Waldhauer, I., A. Steinle. 2006. Proteolytic release of soluble UL16-binding protein 2 (ULBP2) from tumor cells. Cancer Res. 66: 2520-2526. Zou, Y., W. Bresnahan, R. T. Taylor, P. Stastny. 2005. Effect of human cytomegalovirus on expression of MHC class I-related chains A. J. Immunol. 174: 3098-3104. Petersdorf, E. W., K. B. Shuler, G. M. Longton, T. Spies, J. A. Hansen. 1999. Population study of allelic diversity in the human MHC class I-related MIC-A gene. Immunogenetics 49: 605-612. Carson, M.. 1987. Ribbon models of macromolecules. J. Mol. Graph. 5: 103-106.